Everything is alive around us, but we often don't notice. Tree Faery reminds us to look around and see what we usually don't. Who knows? Maybe you will even spot Tree Faery in your own neck of the woods! The original illustration is 7"x8.75" and was created in airbrush and colored pencil. 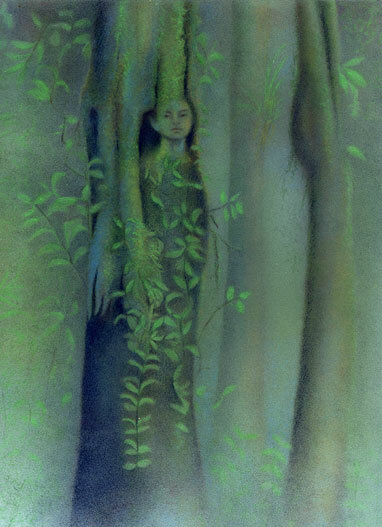 A dryad is a female nature spirit from Greek mythology that presides over a grove or forest. A nature spirit that lives in a tree, such as Tree faery, is referred to as a hamadryad. Tree Faery reminds us to really look at our surroundings to see what we are missing.